[Seattle] Have you heard that Americans need less screen time and more fresh air, fresh food and exercise? Growing food is the perfect remedy! Studies show that gardening provides many benefits such as reduction in stress, improved diets, better sleep and improved health. It can also provide a meaningful connection to the land, other people and healthy food, leading to an overall improved sense of wellness. 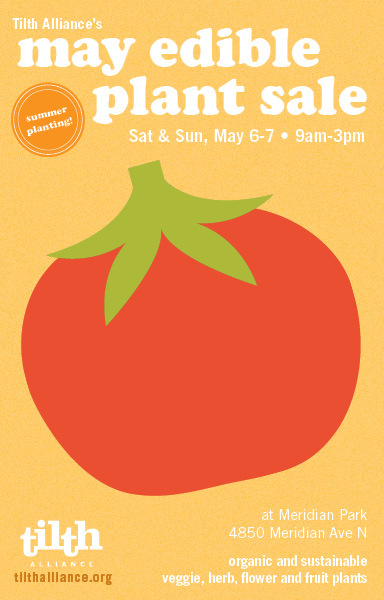 At Tilth Alliance’s May Edible Plant Sale, shoppers can choose from the largest selection of edible plants in the region. It's on Saturday and Sunday, May 6-7, 9 a.m.-3 p.m., at Meridian Park (4850 Meridian Ave. N., Seattle). Check out Hot Tips with information to know before you go. New to gardening or eager to learn more? No problem! Garden and farm educators will be on hand to answer questions about plants, and shoppers can learn organic gardening techniques at the demonstration tent. Gardening books will also be for sale at the Tilth Alliance booth (and worms!). Several vendors will be participating, located in the lower field outside of the main sale. Burnt Ridge Nursery will offer a large and unique selection of edible and native shrubs, trees and vines. There will also be food, gardening supplies and a chicken meet-and-greet offered by Stone Soup Gardens. If you want first pick of the plants and to help raise extra funds for Tilth Alliances's farm and garden education programs, buy a ticket to the Early Bird Sale. The event relies on more than 400 hard working community members to volunteer to help the event run smoothly. Sign-up to volunteer for a shift (or two!) and attend the Early Bird Sale at no cost. All sales support Tilth Alliance's farm and garden education programs, building a sustainable and equitable local food future for all. Big thanks to our sponsors Cedar Grove, Northwest Flower & Garden Show and Big Dipper Wax Works. See you May 6-7! Grow tasty fresh food! Stock up on veggie, herb, flower and fruit plants, plus pollinator flowers, May 6-7 at #MayEdiblePlantSale. Plants are locally, organically and sustainbly grown.